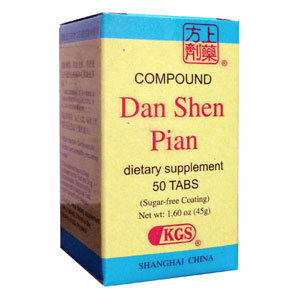 Dan Shen is an effective herb to support the circulatory system. Fu Fang Dan Shen Pian aids in maintaining healthy brain functions, visual equilibrium, and sleeping patterns. Remove blood stasis, promote blood circulation, relieve pain, tranquilize. Chest oppression, blood stasis in coronary heart (artery) disease with symptoms of fixed, stabbing, strong sharp chest pains, possibly worse at night, heart palpitations may be present. Blood stasis in dysmenorrhea or amenorrhea, and in bruises. Please consult a health care professional prior to use. Do not use if pregnant or nursing, or for children 12 years and under. Use with caution in cases of blood deficiency.